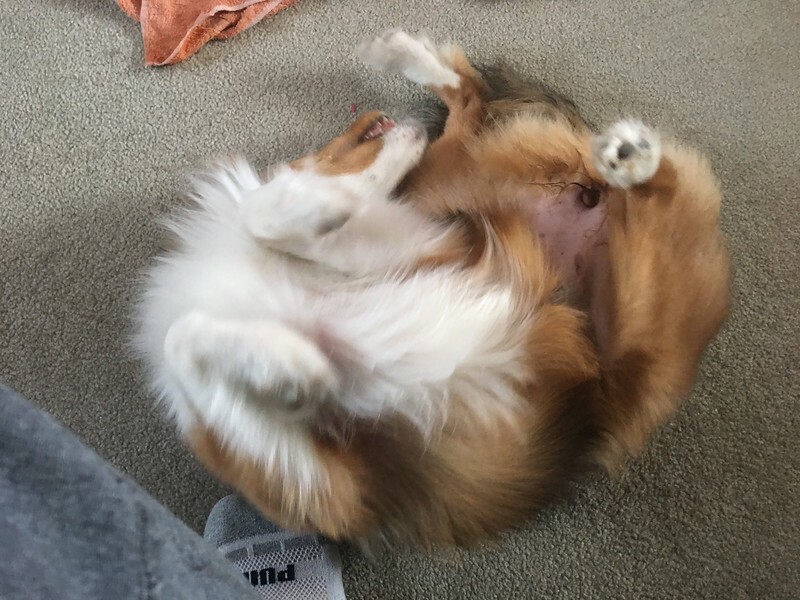 I know many of you believe your Shelties to be brave but Willow is incredible. 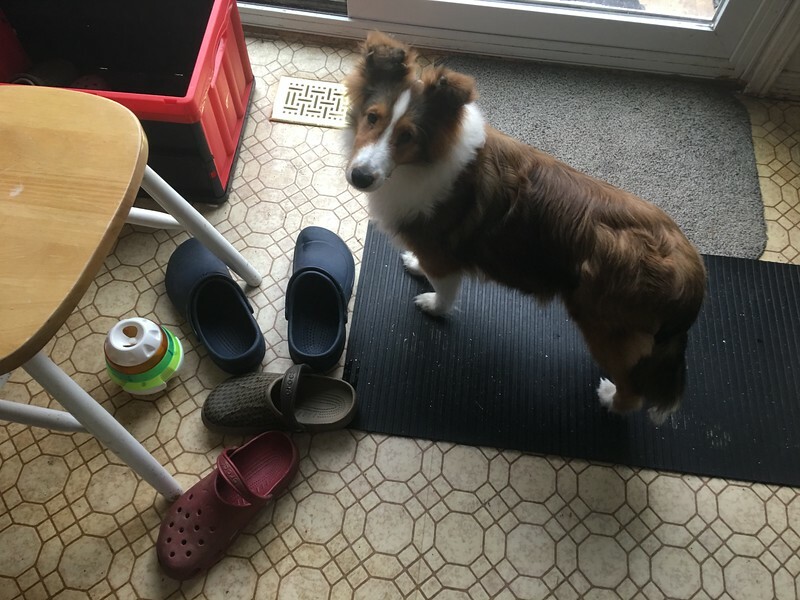 She's the only croc hunting Sheltie that I'm aware of. I don't know where she learned the skill or how she manages to do it without getting hurt but I've seen her corral up to six crocs at a time. Maybe I shouldn't have let her watch Crocodile Dundee with me. Amazing what they can pick up. Here's Willow with four crocs corralled. And laying down fearlessly beside them. And enjoying a well-deserved rest. 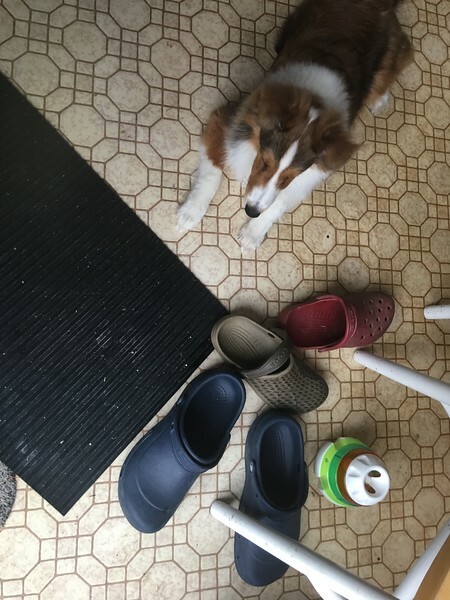 Willow constantly steals our Crocs from the crate by the door and trots around the house with them or gathers them together in a big pile. They are the perfect shoe for housebreaking as they just slip on without having to bend over. They are waterproof, snowproof and pretty non-skid on icy surfaces. We are having rain today, I hope it melts away the ice left in my yard but I'm not too hopeful as they are forecasting more snow for tonight. Technically it may be Spring now but you wouldn't know from my yard. Margi, Calliesmom and Ann like this. Thank you for the morning giggle - life has been rough around here and man, a good chuckle was priceless! I was expecting crocodile toys - not shoes! Never owned a pair, but we have been looking for decent slip-ons now that the snow boots are sort of loosing their appropriateness for outdoor trips; great tip! Willow is so beautiful! Her coat and coloring are coming in so nicely! She is a hoot! Happy hunting Willow!!!! Well what do you expect from a herding dog, Good job Willow. I see a big future in some kind of dog sports for this gal - if agility is not your thing due to strenuousness, consider obedience, rally or Nosework. She is so smart, this little girl and it is fun to see them enjoy the different dog events. Our instructor works her 16 week old Lab puppy on Nosework at the end of every class. They love it and, best of all, it wears them out! ghggp, Calliesmom and GlennR like this. I'm always amazed at how our puppies are attracted to certain shoes. One used to always collect the heaviest, clunkiest shoes she could find from the mud room and drag it around the house. Sometimes she would drag them partway up the stairs and then drop them. Oy! Another one was fond of the leather laces on boat shoes which took quite a beating. Ruffles, who is 5, still insists on putting her nose in hubby's house shoes and sliding them all over like hockey pucks. Flurry has never been partial to shoes, but prefers gloves. And always in pairs, thank you. Checkers is our sophisticate...she liked my dress shoes with heels and the occasional fuzzy slipper if it was mine. Willow is apparently a Crock Collector. Smart girl; they're light, have holes convenient for puppy teeth and make a satisfying herd. She is one funny puppy!